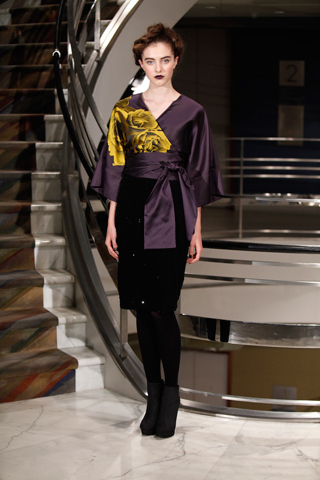 The Josie Natori Fall 2012 RTW presentation was held at the Rubin Museum this season. Heavily inspired by Asian influence the collection featured Kimono-style wrap dresses, coats and separates. Luxury materials like leather, suede, fur, velvet and lace were used. 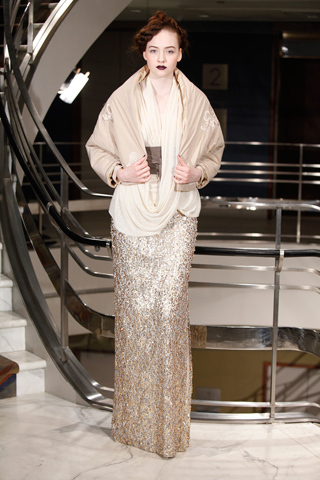 Key trends in this collection were the Kimono inspired looks and the use of Japanese bell sleeves. It was a perfect blend of Asian influence meets a sophisticated yet modern New York look. My favorite piece was the above finale black floor length gown with a sheer flower embroidered back. I would personally pair the dress with matching lace gloves and pearl earrings to complete the glamorous look.